Cancer of paranasal sinus and nasal cavity is a disease in which cancer cells are found in the tissues of the paranasal sinuses or nasal cavity. 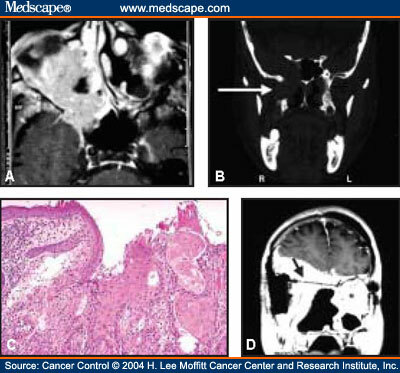 much less often, cancer of paranasal sinus and nasal cavity starts in the color making cells called melanocyties and it's called "melanoma"
if cancer starts in the connecting tissue, it's called "sarcoma"
Usually cancer develops from sinusitis:it is defined as inflammation of the sinuses. The inflammation can be caused by infectious or non infectious triggers. The inflammation leads to blockade of sinus ostia (the normal sinus drenage pathways), which in turn leads to mucus ritention,decreased mucociliary clearance and predisposition to bacterial growth. The combined mucormicosis and aspergillosis is the most frequent display of fungal infection. the cellular H+ pomp is indispensable for the acidification of the lysosomes.Whithout them macrophages can't digest the pathogenous.